Atlanta Packaging UK has just finished the installation of another high-speed Omega stretch wrapping machine for Bisley Office Furniture. 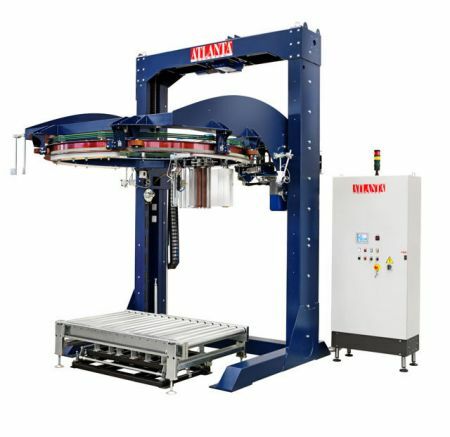 This brings the site total to three Omega machines all capable of wrapping more than 120 cabinets per hour. The installation is part of a £7.2 million expansion at the Newport, South Wales site. As Mark Tucker explains, "The Omega has a unique film delivery system. Instead of paying film out "on demand" each Omega has a system on the infeed to the machine that actually determines the perimeter of the unit to be wrapped and thus delivers the exact amount of film required. We know this will return significant film savings to Bisley as well as improve the aesthetics of the cabinets. Each wrapper can process a filing cabinet in under 30 seconds so overall we can handle 360 cabinets per hour with just these three machines". Unlike its other competitors, the Omega patented system has no electrical sliding contacts, on board electrical generators, or batteries, this means that the rotating ring is much lighter allowing high rotation speeds to be achieved quickly and safely. The ring is so light and strong it can carry a 40kg roll of film extending the reel change period by more than 100% and removing the need, in some cases, to fit automatic reel change equipment. As well as the ring wrappers, Atlanta can also supply turntable and rotating arm machines to suit any application. For slower speeds there is a range of semi automatic pallet wrappers as well. There's nothing to lose and it could be time very well spent.